From Nagtroc. With stock wheels and tires. 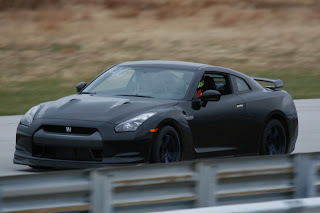 All trackdays were done at my local 2.3 mile track called Mid America Motorplex and my previous best on the street tires was 1:42.8 - We had over 50 cars at the track that day including Z06s, a modded GT3 Porsche and lots of other cool cars and I'm happy to say the GT-R ran the fastest time all day. After switching to the 18" TE37s and R-comp tires (my only mod) I returned for one final session last weekend before they closed for the winter. Track temps were really cold and air temps were 34 degrees all day but I managed to better my time down to 1:39.7 which I'm very happy with considering what the Z06s run out here, heh. That's a full 3 seconds quicker on the r-comps, no other changes to the car besides maxing the front camber on the stock arms and re-setting toe to zero. Who said the stock GT-R tires were real R compounds ? BTW, racing season starting again soon, I'll try and give you more updates on the car's progression and new mods. 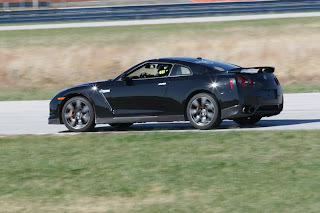 The stock GT-R tires are sticky street tires, definitely not an R compound in what I call an R compound. 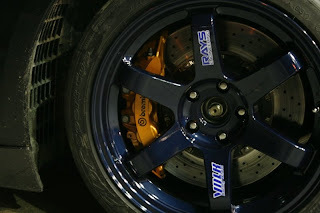 What sizes and offsets are you running in the 18" ? Some people talk about trans temps with smaller tires, but I suspect they are running different OD front and rear. Let me know about any updates. Check out my recent videos of the R32 GT-R I took out to Buttonwillow for West Coast 2.